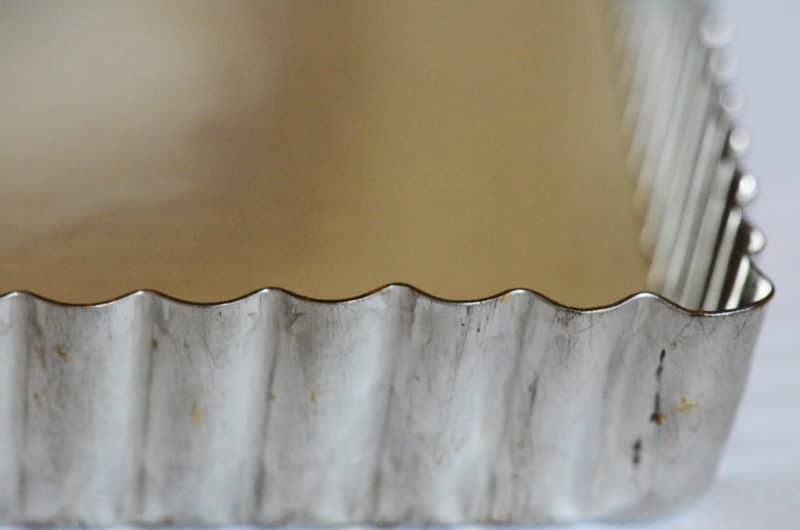 The fluted-edged, removable-bottomed tart pan comes out to play with some frequency in my kitchen. It’s not just that I’m a sucker for the beauty of the pan, though that does have its role (who can resist such a pretty thing?). This is one of those instances where form and function meet in perfect balance. The chi, the energy, of these pans is in true alignment. I suppose we all could take a lesson from that. It’s a pan that is perhaps most often associated with summer, for a tart’s ability to show off berries and other fruits with such finesse. For me, it’s a pan far more frequently used in seasons other than summer, to cradle my favorite lemon meringue tart (in spring, when we need brightness in the north so badly), and even more often to hold my prized, holiday-perfect, chocolate-caramel pecan tart—one of my all-time favorite desserts to make and to eat. My tart pan collection consists of three beauties: the traditional round, a long and narrow rectangular, and a square. Each one is good for different types of tarts, and each one results in a different type of slice. The square will have a few pieces from the center of the pan that don’t have the fluted crust on them, unless the slices are cut fairly large. I use this shape the least but I still enjoy having it around. The rectangular pan is a crust-lovers shape because every piece has two edges of fluted crust with it from either side of the pan. And the slices are such lovely rectangular shapes themselves. It’s the classic round tart pan that is, and always will be, my go-to. The balance here is about the right amount of crust and filling in every slice, and the shape of the finished tart fits beautifully on any platter or cake plate or dinner plate, for display. We have to put our desserts out for admiration and to cultivate longing far before they’re served, don’t we? Always line the bottom of the pan with parchment. 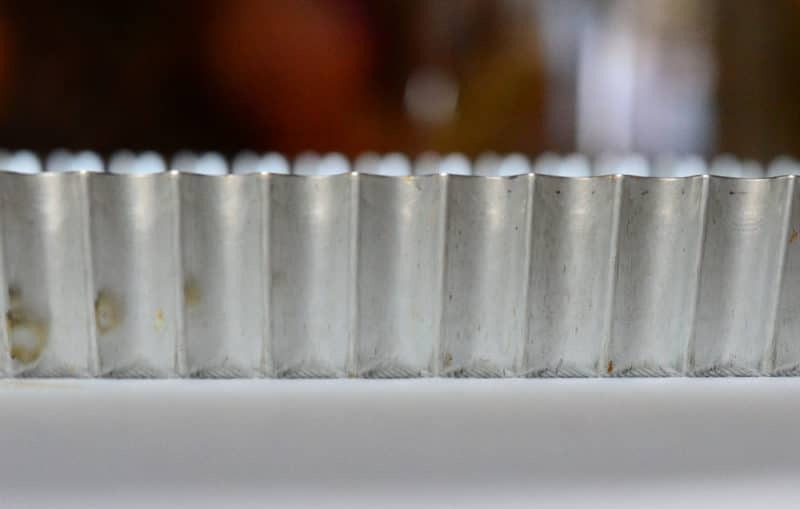 Either buy parchment rounds to make life easy, or trace the bottom of the tart pan on parchment, then cut the circle, square, or rectangle out. It’s easy to imagine that the buttery crust ought to slide right off the pan bottom of the pan, but trust my own experience when I say that it doesn’t. It’s considered bad table form to serve your tart with the metal bottom still attached to it. Remove it using a big spatula that gets under the parchment and moves the tart off with ease. Remove the ring, or edge, of the pan with ease by setting it on something tall and narrow, like a jar, and letting the rim fall to the counter. The tart may require a little adjusting, a little gentle prodding, to get the ring to release, but then it will, and off you go with your tart. If you remove the ring with the tart just in your two hands, it’s awkward as all get-out. Plus you’ll find yourself with the tart in your hands and the ring hanging off your elbow like a massive bangle bracelet. It just ain’t kitchen-cool. If you don’t have a tart pan because you don’t think you’ll use it often enough, I’m begging you to give it a shot for the holidays this year. Buy one here, sized at 9.5″ or 10″. I have an easy, nutty-good crust recipe that doesn’t even require a rolling pin. Once you try the special tart that I’ve made so many times now that I call it MY chocolate-caramel pecan tart, you’ll be making it so often yourself that you’ll start calling it YOUR tart soon enough. 13 Responses to "Favorite Things: Tart Pans"
What a revelation–I never even heard of a tart pan or a no rolling-pin crust. My mother made cakes and pies to perfection and I have had so few tarts in my life that they are not even on my radar. So now I am curious. And thanks for the tips, as I would definitely be a candidate for tart pan bracelets! Maureen, thank you for this helpful article! I’ve recently started baking with tart pans and I have two questions for you – if you don’t mind. 1) I’ve occasionally had problems separating my (9-inch round) tart from the bottom plate. The ring always falls off easily. Can you please tell me what sort of “big spatula” you recommend? Brand name and/or weblink maybe? 2) I recently purchased a 5 x 14 inch rectangular tart pan (Fox Run) that I’m anxious to try out, but realized I don’t have a serving plate to accommodate this size. I’ve been searching the web and having a tough time finding an appropriate serving dish. Everything I see is either too small, ridiculously large, or downright unattractive. Can you recommend a simple serving platter? Thanks! Hi Calvin–thanks for your great questions. I use a long metal spatula (see the 5-7 inch metal spatulas on this page). 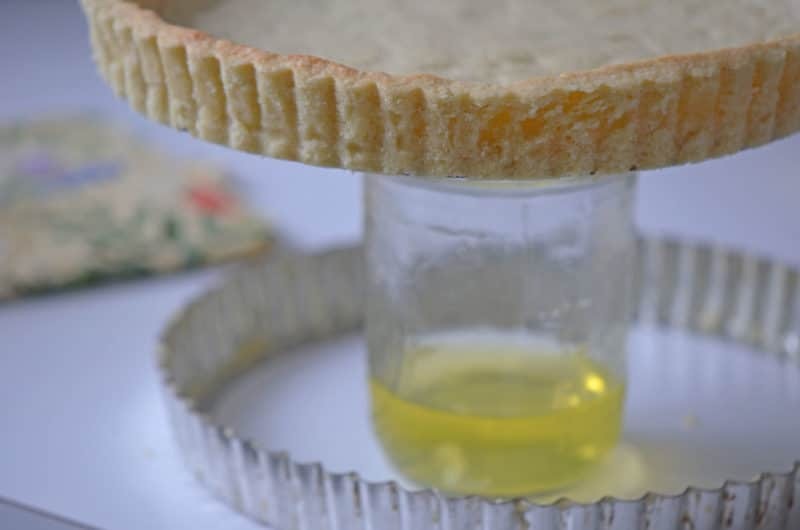 Also try greasing the tart pan bottom, topping with parchment, then greasing again on top of the parchment. 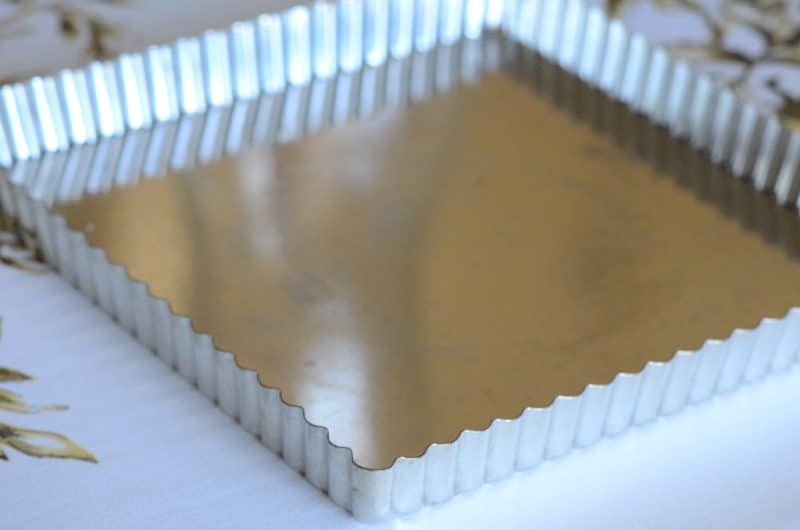 For the oblong tart, look for rectangular cake plates like this. Thanks for your time Maureen – I’ll grab one of those spatulas for sure! great tips. I am starting to bake pies and tarts. Have never done so cos I dont have the courage. But the pie pan i have does not come with a removable bottom. would love to try ur choc pecan recipe. Thank you Inda! The chocolate pecan tart is SO good, well worth the investment in the tart pan! Hello! 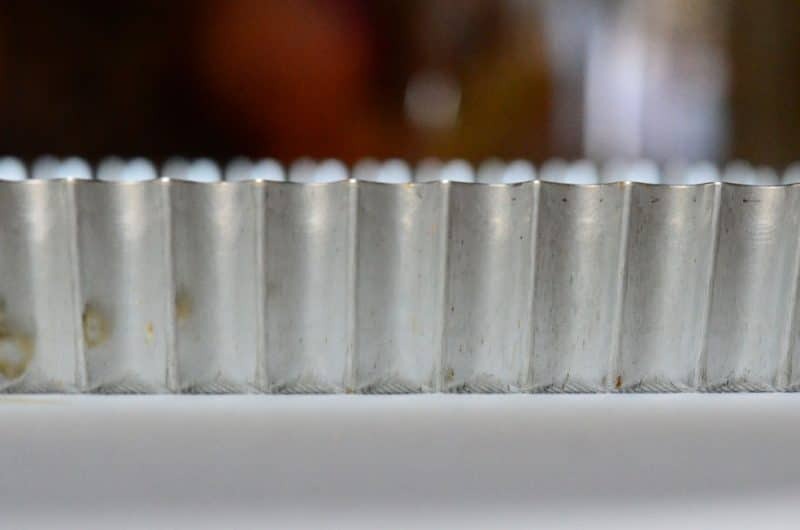 Usually the tart will lift off the tart pan bottom and the parchment will remain on the pan; if not, you can lift the tart up and peel the parchment from the bottom of the tart. Hi Hira…check it out here! It’s a huge help to use the parchment, Nicol!